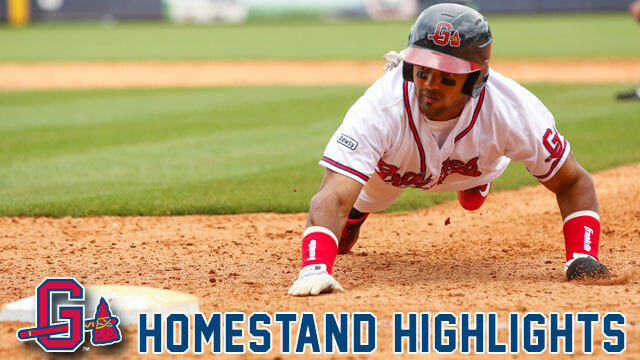 LAWRENCEVILLE, GA - The Gwinnett Braves return home for a six-game homestand from Friday, May 27 through Wednesday, June 1. The G-Braves host the Syracuse Chiefs (Triple-A affiliate of the Washington Nationals) from May 27-29 and the Pawtucket Red Sox (Triple-A affiliate of the Boston Red Sox) from May 31-June 1. The homestand begins with Fox 5 Friday Night Fireworks on May 27 and continues with the Camo Hat Giveaway, presented by Coolray Heating and Cooling, on May 28. On May 30, following a special 6:05 p.m. start time, there will be post-game fireworks to cap Memorial Day. Syracuse Chiefs (Washington Nationals) vs. Gwinnett Braves, 7:05 p.m.
FOX 5 Friday Night Fireworks - Stick around after the game for a spectacular fireworks display, presented by FOX 5 Atlanta. Camo Hat Giveaway - The first 2,500 fans will receive a G-Braves' camo hat, courtesy of Coolray Heating and Cooling. Syracuse Chiefs (Washington Nationals) vs. Gwinnett Braves, 2:05 p.m.
Sunday Funday - Fans are invited to play catch on the field before the game from 1:10-1:25 p.m. and kids (ages 12 and under) are welcome to run the bases following the game as part of "Sunday Funday" presented by Georgia United Credit Union. Pawtucket Red Sox (Boston Red Sox) vs. Gwinnett Braves, 6:05 p.m.
Memorial Day Fireworks - Stick around after the 6:05 p.m. game for a Memorial Day fireworks display. Pawtucket Red Sox (Boston Red Sox) vs. Gwinnett Braves, 7:05 p.m.